With the new Guild Heraldry feature, Guilds can create their own Heraldry and display it proudly! 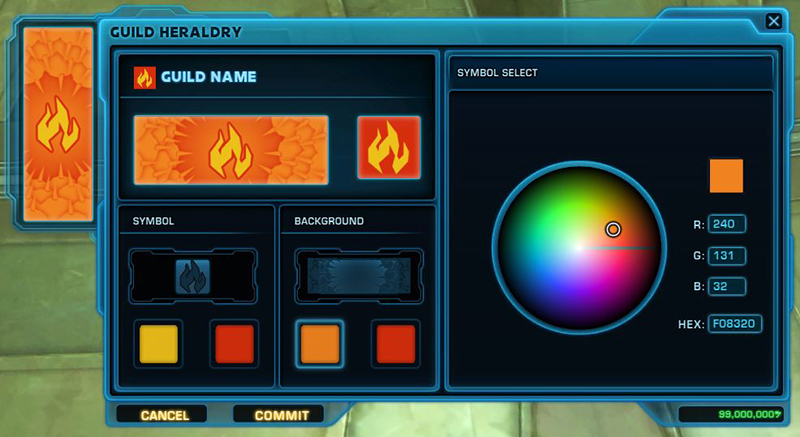 Between the combination of Symbols, Backgrounds, and a variety of colors, Guilds will be able to create something truly unique. There are Symbols ranging from Starships, Blasters, and even Aerebesh to more unique things like a frothy Cantina mug! The Backgrounds range from simple to detailed designs, making it possible to find the perfect combination! Tying these two pieces together is the utilization of the color wheel. If you have a color narrowed down to the exact hex code, that can be used as well. A Guild’s Heraldry will be displayed in a variety of places - the general Guild window, the Conquest planetary leaderboards, character portraits, and more! The Preview Window allows for players to see what armor sets, weapons, mounts, decorations, and other items look like before purchasing. This system has been rebuilt from the ground up, which has allowed us to add more functionality. An exciting feature that we’ve added is a button for animating the previewed object - running, mount flourishes, and weapon/combat animations will all be viewable now. You’ll also see there’s an entirely new UI to better relay what equipment, mounts, and pets are currently being previewed in the window. Speaking of mounts, players will now appear riding / piloting the mounts previewed instead of being off to the side! Want to know how a specific emote or mood would look on a character before purchasing? You’re in luck - emotes, moods, and rest and recharge actions will also be supported by the new Preview Window.